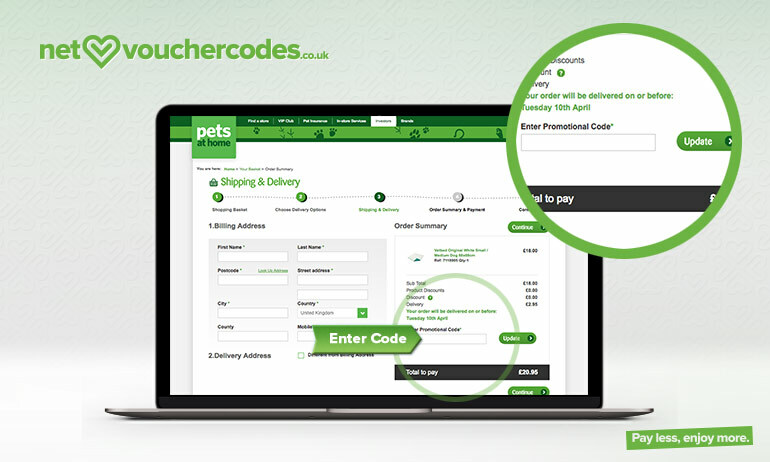 Where do I use my Pets at Home voucher code? Browse through our deals, copy a code and follow our link to the Pets at home website. Here you can look for the products you want and click ‘Add to basket’ on the things you want. Once you’re finished shopping you can then ‘View your basket/checkout’. Select your delivery options and click ‘Continue’. You’ll then be taken to the shipping and delivery page where you can paste your code into the ‘Promotional code’ box and click ‘Update’. "Get 10% off your next order as soon as you sign up for the Pets at Home VIP Club." 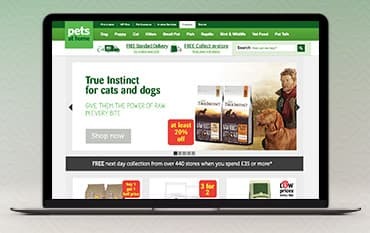 Pets at Home has been a family favourite in Britain's homes for decades, and with now 350 stores across the UK, look no further than Pets at Home for all your pet supplies. As well as selling everything you need for your pet, Pets at Home also offer in-store grooming and pet services. With your pets safety, wellbeing and health at the heart of everything they do, pets at Home take the responsible and ethical treatment of animals very seriously and ensure their staff are trained extensively in animal care and animal welfare so you can rest assured your pet is in good hands with Pets at Home. Pets at Home employees are passionate about animals and are always keen to help you make the best choice for your purchase. Whether you have a dog, cat, fish, bird, reptile or rodent, you can guarantee to find all the essentials your pet needs at affordable prices so look no further than Pets at Home. Pets at Home is more than just a pet store, check out your local store and enjoy in-store pet services to help keep your pet fighting fit! If your feline is feeling poorly or your puppy isn’t quite themselves, the Pets at Home team of vets can help nurse them back to health. Offering worming consultations and services, microchipping advice on nutrition as well as offering up to 400 veterinary services, you can guarantee your pet is in safe hands with Pet at Home. Providing for your pet can sometimes cost a small fortune, especially when it comes to pet food, accessories and maintaining the general well being of your pet. It’s, for this reason, we here at NetVoucherCodes offer a wide array of money-saving discount codes which can help you make great savings online at Pets at Home. We know just how important your pet is to you so why not treat your pet to the care it deserves with Pets at Home. Whatever pet you have residing in your home, you can uncover a huge selection of toys and both outdoor and indoor accessories to keep them cherpy, whatever time of year it is! Whether it’s a dog collar or cat flap, toys, grooming accessories and much more, there is a wide collection awaiting you and your pet at Pets at Home so check out the range today. A Pets at Home Voucher Code could help you save on the essentials, so, whatever you pet, let them know just how much you care about them with the Pet at Homes Pet Accessories selection today and pay less for your pets goods with NetVoucherCodes. At Pets at Home, you can enjoy a selection of dog supplies which cover it all! If you want to keep your furry friend happy, healthy and full of life, look no further than Pets at Home. From food and treats to dog beds, collars & leads, toys, grooming and so much more. Your dog can even enjoy veterinary treatments and worming consultations. The Pets at Home team are as passionate about keeping your dog fit and healthy just as much as you are which is why they offer a huge array of products and services to ensure they have a spring in their step. If you want to make a return, you can do so via post, in-store or you can arrange for a courier to collect your product. Your item will need to be in the condition in which it was purchased. 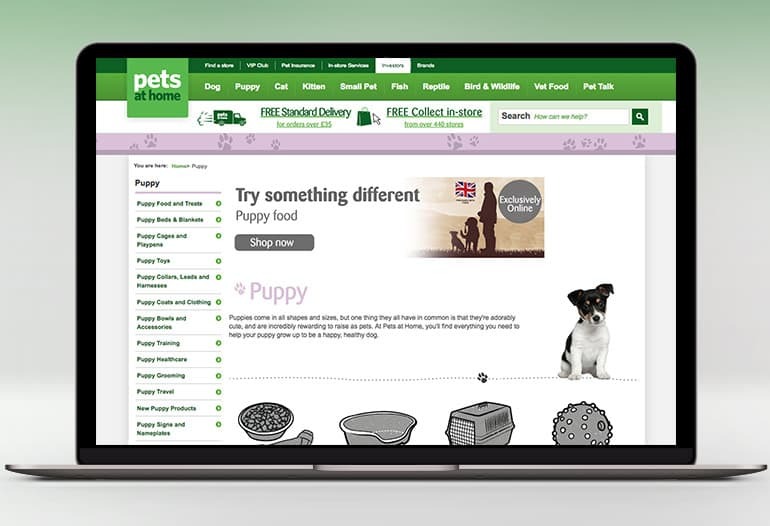 As the UK’s Leading Pet Specialist, everything you could ever need for your pet's health & Wellbeing can be found at Pets at home, both online and instore. Find supplies for your furry friends, or, if you own more exotic pets like lizards or snakes, you can also find an array of accessories. Whether you’re looking for a new tank for your fishes, a litter tray for your kitten or a cage for your budgie, there is so much to choose from at Pets at Home to cover a wide range of your pets needs. With a Pets at Home discount code, you could save money on all your pets needs when you shop online.